CAA has awarded five Millard Meiss Publication Grants for spring 2008. Thanks to the generous bequest of the late Prof. Millard Meiss, these grants are given twice annually to publishers to support the publication of scholarly books in art history and related fields. As the current term of the Art Journal editor-in-chief is coming to its conclusion, CAA invites applicants for the next term, July 1, 2009–June 30, 2012 (preceded by a term as editor designate from November 2008 to June 2009). Art Journal, published quarterly by CAA, promotes informed discussion about issues across disciplines in twentieth- and twenty-first-century art, nationally and internationally. Candidates may be artists, art historians, art critics, art educators, curators, or other art professionals; institutional affiliation is not required. Advised by the Art Journal Editorial Board, the editor-in-chief is responsible for the content and character of the journal. He or she reads all submitted manuscripts and reviews all submitted artist projects, sends them to peer reviewers, provides guidance to authors and artists concerning the form and content of submissions, and makes final decisions regarding the acceptability of all submissions for publication. The editor-in-chief is not responsible for commissioning reviews. The editor-in-chief works closely with CAA staff in New York, where the publication is produced. This is a half-time position. CAA may negotiate course release or other compensation for the editor. The editor-in-chief attends the three annual meetings of the Art Journal Editorial Board—held in the spring and fall in New York and in February at the Annual Conference—and submits an annual report to CAA’s Publications Committee. CAA reimburses the editor-in-chief for travel and lodging expenses for the spring and fall New York meetings in accordance with its travel policy, but he or she pays these expenses to attend the conference. Candidates must be current CAA members and should not be serving on the editorial board of a competitive journal or on another CAA editorial board or committee. Nominators should ascertain their nominee’s willingness to serve before submitting a name; self-nominations are also welcome. Please send a statement describing your interest in and qualifications for appointment, CV, and at least one letter of recommendation to: Director of Publications, Art Journal Editor-in-Chief Search, CAA, 275 Seventh Ave., 18th Floor, New York, NY 10001. Deadline: September 15, 2008; finalists will be interviewed October 23, 2008, in New York. 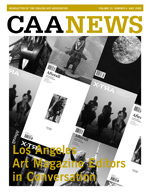 Beginning with the September 2008 issue, CAA News will once again be printed and mailed to all individual and institutional members six times a year. In July 2007, the newsletter transformed from printed publication to a PDF document distributed online primarily to balance the previous year’s budget. The decision, made by the CAA Board of Directors, was not a permanent one. Going from 32–48 pages to 16–24 pages per issue, the new CAA News will focus largely on organizational business, providing updates on the Annual Conference; listing individual- and institutional-member achievements; publishing calls for participation for CAA committees, editorial boards, awards committees; and more. At the same time, CAA plans to beef up its website, with more online-only content. Former newsletter sections such as the Advocacy Update and the Obituaries, for example, will be exclusive to the web as part of a larger initiative to revamp the CAA website. We want www.collegeart.org to become an indispensable resource for artists and scholars, curators and educators, and critics and other arts professionals throughout the year. CAA News will continue to appear as a PDF document on the website; past issues go back to March 2002. Posted at the beginning of the month of publication, the newsletter can be read immediately—before the printed publication arrives in your mailbox. If you wish to receive CAA News in electronic format only, please contact CAA Member Services.